Power breakfasts can be hard to keep exciting and oatmeal is the quintessential example of this phenomenon. I know so many people who suffer through eating the same old “bowl of mush” every morning and it’s a shame, really, because oatmeal is a great breakfast for active individuals. And it has tons of potential for delighting the taste buds! Oats are full of nutritional benefits. They’re high in beta-glucan, which, when consumed regularly, can help reduce LDL cholesterol (the bad one) levels, resulting in improved heart health and blood sugar. Oats also provide a hefty dose of magnesium, a mineral that most of us don’t get enough of. Magnesium is critical for energy production and a magnesium deficiency will negatively affect the body’s ability to utilize calcium, vitamin D, and vitamin K. And, as you probably already know, oats also provide a hefty dose of fiber that will help keep your digestive tract happy and regulate the metabolism of carbohydrates. What Type of Oats Should You Buy? There are many options when it comes to buying oats. Steel-cut, quick-cooking, rolled…what’s best? Here’s a quick explanation of the different types. Oats are rarely eaten in their unprocessed form. Processing the whole oat kernels down into smaller pieces means that the resulting oatmeal will cook much faster. Whole oat kernels take up to an hour to prepare. There are three main types of oatmeal available at the market. Steel-Cut Oats are the least processed of these three. The simple process cuts whole oat kernels into large pieces. Minimal processing means that they require more time to cook (approximately 20 minutes), but they’re slightly lower on the glycemic index. They also maintain a bit more texture than the other varieties. Rolled Oats are what most people know as oatmeal. Whole oat kernels are lightly steamed and then rolled flat. This is the middle ground in terms of processing. They require about 10 minutes to cook, but are metabolized a bit faster than steel-cut oats. The finished product will be porridge-like with less texture. Instant Oats are steamed and rolled as well, but are steamed for a longer period of time. This precooking means that they require little more than some hot water and a quick stir to prepare, but also means that they spike blood sugar more than rolled or steel-cut varieties. Another downside to the instant-cooking process is that it’s harder to infuse flavors from other ingredients into the final product. 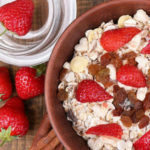 Whether you slowly simmer minimally processed oats or simply add water to the instant stuff, these five easy options will help make your morning oatmeal not only more exciting and flavorful, but more nutritious. Adding dairy milk, or any nondairy alternative, improves oatmeal’s texture, making it feel a bit more “creamy.” More importantly, milk provides protein to help round out oatmeal’s nutritional profile as oats only provide a small amount of incomplete protein. Use a bit less water when adding milk to oatmeal, so that the consistency doesn’t get too thin. Experiment with: cow’s milk, goat’s milk, soy milk, almond milk, hemp milk. With a little experimentation, you’ll quickly discover that you can improve the flavor of your oatmeal with a little spice. Just start with a little and slowly add more until the flavor is to your liking (you can always add more, but it’s much harder to remove what you put in). Many spices also improve digestion and cinnamon, a popular oatmeal addition, helps regulate blood sugar metabolism and is especially helpful for those suffering from type 2 diabetes. Experiment with: cinnamon, cardamom, nutmeg, ginger, allspice. This might be the simplest way to improve your oatmeal experience. Grab a handful of your favorite nuts or seeds and toss them into your bowl to create a more interesting texture and boost your meal’s nutritional value. Nuts and seeds are packed full of quality fats, which not only help satiate, but can also help nourish connective tissue and may even improve your mood. Some folks enjoy swirling nut butters into their oatmeal as well. Give it a try! Experiment with: almonds, walnuts, macadamia nuts, pumpkin seeds, hemp seeds, chia seeds. Sure, you could settle for the standard raisins or dried apples that are often found in instant oatmeal, but there are many other more exotic options to explore. I really like adding fresh fruit early in the cooking process because it breaks down and infuses the oatmeal with flavor. Fruit also provides additional vitamins, minerals, and phytonutrients. Experiment with: bananas, pears, figs, pineapple, plums, berries. While we all should be mindful of our sugar intake, adding a touch of sweetener to a batch of oatmeal will help to ensure that the final product does not taste like gruel. The sweeteners listed below do contain a decent amount of simple sugars, but are balanced by B vitamins and minerals that help the body use those sugars more efficiently. Experiment with: molasses, real maple syrup, coconut sugar, rapadura/sucanat (whole cane sugar), sorghum. This delicious Banana Oatmeal is a great way to get started, it’s one of my favorite oatmeal recipes. This is one power breakfast that won't get old. Our Banana Coconut Oatmeal is lightly sweetened and delicious. Add oats and salt; cook, over medium-low heat, stirring frequently, for 5 to 6 minutes. Add banana, coconut, cinnamon, and cardamom; cook, stirring frequently, for 1 to 2 minutes, or until the banana softens. Remove from heat. Add hemp seeds, and almond milk; serve immediately.